Just over a year ago, I announced an exciting new project focused on delivering real-time distributed PV simulations to distribution network service providers (DNSPs). This is an Australian Renewable Energy Agency (ARENA) funded research project, led by the Australian National University. As the Chief Investigator on this research project, I have spent the last year regularly meeting with and networking with DNSPs across the country. As a result, we now have 12 of the 15 DNSPs on board, which is a tremendous outcome. Each of theses DNSPs is providing us with the metadata for the installed PV system within their networks, which we are using to produce simulations of their power output. This work extends the efforts of my PhD, where I built the Regional PV Simulation System (RPSS) through collaboration with locality utility ActewAGL, but adds new capability through real-time PV monitoring and derived irradiance estimates from the Himawari 8 satellite. This week, I am at the PVSC44 conference, co-chairing the session on solar forecasting for grid integration of PV, as well as presenting a paper which outlines our modelling methodology for this new tool. I wanted to take the chance to put up an accompanying blog post, to help make it easily accessible to my fellow researchers. Of course if you want the real details, you should check out the paper :-). It is important to note that the following methods are the result of a close industry collaboration with industry partner Solcast, and represented the state-of-the-art of its satellite nowcasting technologies from early 2017. 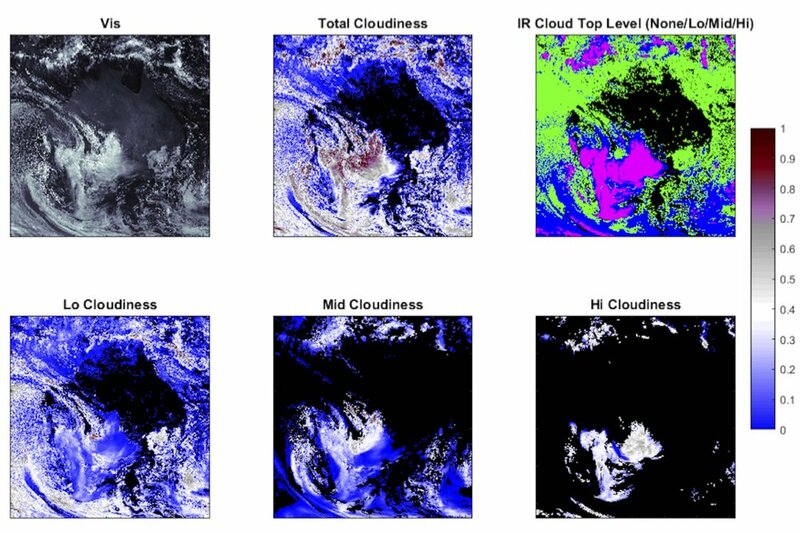 Here's how it all works..
We take images from the Himawari-8 satellite, in particular the visible and infrared channels, and apply the general principles of the Heliosat-2 approach for turning these into cloud opacity estimates. What's very interesting about this process, is that the spatial and temporal scales of this data are quite advanced, as compared to other geostationary weather satellites (e.g. GOES 13/15 over the US). At 1-2km^2 resolution with 10 minute update cycles, the radiation modelling enabled by this satellite is quite an exciting advancement for our field. We use the Himawari 8 data in combination with the GFS NWP model to decompose clouds into lower, middle and upper troposphere layers, and then aggregate these layers to estimate total cloudiness. Total cloud opacity (represented as an index between 0 and 1) is then derived using differences between the lowest visible return value of albedo. With this value in hand, we apply a linear reduction to the Esra clear sky radiation model to produce an estimate of global horizontal irradiance (Gh) for each pixel. Estimates of Gh are afterwards decomposed into direct normal irradiance (Bn) and diffuse horizontal irradiance (Dh) through the Engerer2 separation model. Radiation Validation on "Estimated Actuals"
For this conference paper, we have validated the Gh values produced by this system. These "Estimated Actuals" are produced using the satellite scan for each time stamp (no forecasting involved). It is necessary to compare these outputs to the observed radiation conditions at the surface, which we accomplish using data from the Australian Bureau of Meteorology. Using 7 sites and 2 months of data from the BoM, we were able to determine these estimated actuals to have a Mean Bias Error (MBE) of -7 W m-2 and Root Mean Squared Error (RMSE) of 55 W m-2. This accomplishes the industry standard of a 'good' radiation model, which is defined in the literature as having an relative MBE less than 5% (1.8% reported) and relative RMSE less than 15% (10.7% reported). The next step in the methodology is to compute PV power output calculations, based on the installed characteristics of the PV systems considered. This requires information such as the azimuth & tilt of the system, as well as the total installed capacity. We apply the Reindl transposition model to estimate the available plane of array irradiance, followed by a quadratic PV power model to compute the estimated power output. By combining the Estimated Actuals from the satellite system with this model, we also can compute Estimated Actuals for PV system power output. In order to accomplish this step & validate it, we collected data from 78 PV systems across the Canberra, Australia region for a period of 6 months. Using these time-series data, we then applied our QCPV methodology to both quality control the reported power outputs, but also to determine the actual azimuths & tilts for the POA radiation modelling step. For this validation, we report an MBE of 0.04 W/Wp and RMSE of 0.15 W/Wp. Overall scatter in the validation data shows well behaved results, but with accuracy losses nearly double that of the radiation validation. 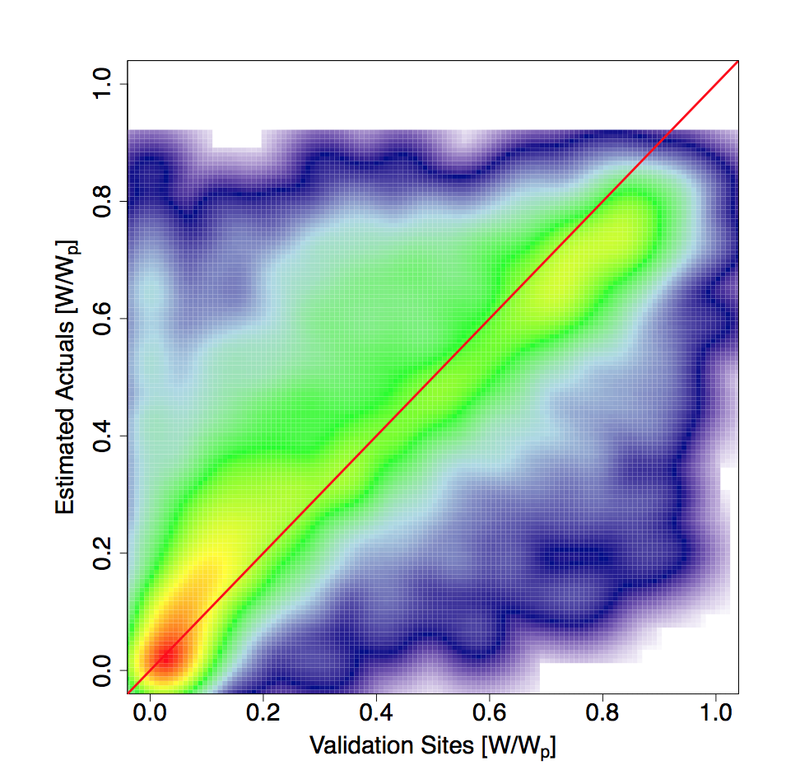 We note that this validation reports uneven bias across the distribution of PV system measurement values, suggesting further refinement of the quadratic PV model coefficients could be required. In the provided image, we see the Estimated Actuals for each individual PV system in the ActewAGL network, as provided for the 23rd of June 2016. This day was selected based upon its complicated, multi-layered cloud conditions to best demonstrate the capability of this system in a challenging circumstance. A heat map colour profile shows the relative power output from each PV system based on its installed capacity. This is accompanied by the data from the 6 PV cross-validation sites in the circles which are colour filled according to their observed power output. At bottom right of this image, the Estimated Actuals for these systems are displayed in grey, with the red line showing the observed power output values. Overall, we observe a slightly positive bias in the Estimated Actuals of 0.038 W/Wp and a relatively lower RMSE value of 0.12 W/Wp. A Great Start: Where Next? Overall, our team is quite happy with this first set of results, but we've many improvements to make to this system moving forward. As a part of this validation, we've already found & corrected issues with positive cloud opacity bias during overcast conditions, and we have implemented a dynamic kernel which corrects the cloud shadow displacement at low sun angles. Up next for us, is improving the radiation modelling routines. For one, Engerer2 was not designed for this purpose and our linear reduction on the Esra model needs to be updated. The good news is, we've filled up our team with postdocs, PhDs, honours students and software developers, and are working hard to make these updates. Soon, we'll even highlight the forecasting capability we've added to the system in an upcoming issue of Progress in Solar Energy. In the meantime, we're deploying this system for our participating DNSP partners right now, and will iterate forward based on their feedback. So check back soon and connect with us on Research Gate to stay up to date & to collaborate. It's all a part of teaming up for that solar-powered future! And in that spirit be sure to check out our data sharing campaign, where we are making the output of this system available for your research purposes. Read more at this link! Lastly, the ANU team would like thank & acknowledge our industry partner Solcast's contributions to this project.